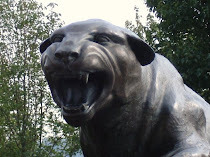 CARDIAC HILL - A Pitt Panthers Blog: What Layoff? You hate to use the expression, but Pitt looked like a whole different team tonight in the 25-point win over Ohio. Now, I didn't say they were perfect. The turnover issue was as bad as it's ever been (21). But Pitt shot much better from the field (55%), rebounded fairly well (+14), and played pretty good defense, holding Ohio to an abysmal 23.9% from the field with only six assists. They even connected on 75% of their FTs. Ohio wasn't supposed to be this much of a pushover, coming in with a respectable 7-3 record and with five guys scoring in double figures (and a sixth at 9.9). Their record was good for first-place in the MAC. Pitt was favored coming in, but only 11. Ashton Gibbs again led the team in scoring, but was hardly the story - that would be the strong play of Jermaine Dixon and Gilbert Brown. I'd hate to try to attribute all of that to Gilbert Brown coming back, because that would be silly. Right? Truth be told, the offense flowed much better with him back and Dixon finally looked comfortable out there, scoring 14 points, and adding six rebounds and six assists. Gil didn't miss a shot and ended up with 11 points in just 18 minutes. Apparently, the talk about him being in shape wasn't just smoke. Coming into the game after Pitt built up a lead probably helped to ease the transition and he really seemed as if he hadn't missed a beat. Looking solely at this game, I could even see him starting in the Big East opener vs. Depaul. The questions remain about where Gil will fit in, but at this point, it's pretty clear Pitt just needs to keep him on the court. His versatility is a huge plus and should make it easy for him to get 25-30 minutes a game. 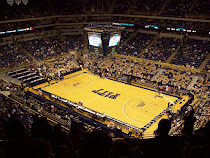 I'm not ready to declare that Pitt is back or even guarantee a spot in the NCAA tournament. But if you watched this game, you could see a markedly better team. And in the Bonus Section mold, Ray Fittipaldo of the PG holds his weekly chat and discusses Pitt's postseason outlook, the team's go to shooter at the end of games, and the chances of Isaiah Epps starting next season. I agree, they looked much better, but the jury is still out. They showed a flash tonight we have not seen all season. The jury is definitely still out - trying not to get too positive over beating a team that we should have, but it's hard for me to do that as I think this is the best they've looked all year. But you're right - a game against a MAC team who traditionally isn't very good is not exactly a great measuring stick. But they definitely looked much more comfortable, despite all of the turnovers.